Hubble has revealed that mysterious “blue blobs” in a structure called Arp’s Loop between M81 and M82 are blue clusters of stars less than 200 million years old with many stars as young as, and even younger than, 10 million years. Finding blue blobs in space sounds like an encounter with an alien out of a science fiction movie. But the powerful NASA/ESA Hubble Space Telescope has resolved strange objects nicknamed “blobs” and found them to be brilliant blue clusters of stars born in the swirls and eddies of a galactic pile-up 200 million years ago. The findings are reported by Duilia de Mello of the Catholic University of America, Washington, D.C. and NASA’s Goddard Space Flight Center, Greenbelt, Md. and her colleagues at the 211th meeting of the American Astronomical Society in Austin, Texas, USA. Such “blue blobs”- each weighing tens of thousands of solar masses -have never been seen in detail before in such sparse locations, say researchers. They are more massive than most open clusters found inside galaxies, but a fraction of the mass of globular star clusters that orbit a galaxy. Because the orphan stars don’t belong to any particular galaxy, the heavier elements produced in their fusion furnaces may easily be expelled back into intergalactic space. This may offer clues as to how the early universe was “polluted” with heavier elements early in its history, say researchers. The mystery is that the “blue blobs” are found along a wispy bridge of gas strung among three colliding galaxies, M81, M82, and NGC 3077, residing approximately 12 million light-years from Earth. This is not the place astronomers expect to find star clusters: in the “abyssal plain” of intergalactic space. “We could not believe it, the stars were in the middle of nowhere”, says de Mello. The “blue blobs” are clumped together in a structure called Arp’s Loop, along the tenuous gas bridge. The gas filaments were considered too thin to accumulate enough material to actually build this many stars, says de Mello. But Hubble reveals the “blue blobs” contain the equivalent of five Orion Nebulae. After finding that these “blobs” resolved into stars, the team used the Hubble image to measure an age for the clusters of less than 200 million years old with many stars as young as, and even younger than, 10 million years. Not coincidentally, 200 million years is the estimated age of the galactic collision that created the tidal gas streamers, pulled between the galaxies like candy floss. De Mello and her team propose that the star clusters in this diffuse structure might have formed from gas collisions and the subsequent turbulence, which enhanced the density of the gas streams locally. Galaxy collisions were much more frequent in the early Universe, so “blue blobs” should have been common. After the stars burned out or exploded, the heavier elements forged in their nuclear furnaces would have been ejected to enrich intergalactic space. Radio observations with the Very Large Array of radio telescopes in Socorro, New Mexico, USA, gave a detailed map of the intergalactic bridge that revealed knots of denser gas. Studies with the 3.5m WIYN telescope on Kitt Peak in Arizona, USA, mapped the optical light glow of hydrogen along the bridge. 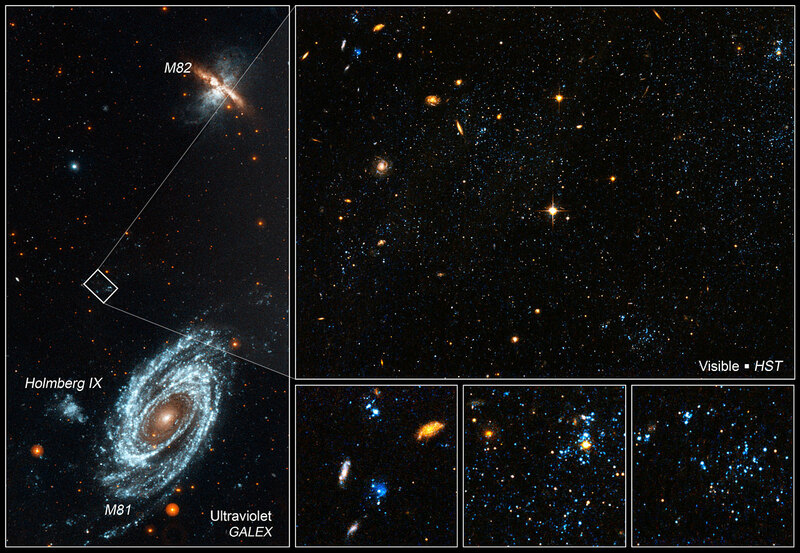 Observations with NASA’s Galaxy Evolution Explorer (GALEX) ultraviolet space telescope revealed an ultraviolet glow at the knots, and that earned them the nickname “blue blobs”. But GALEX did not have the resolution to see individual stars or clusters. Only Hubble’s Advanced Camera for Surveys at last revealed the point sources of the ultraviolet radiation.